Taiwanese fried chicken joint, Monga Fried Chicken, has a huge following in Taiwan as well as flagship sites in Toronto and Houston. 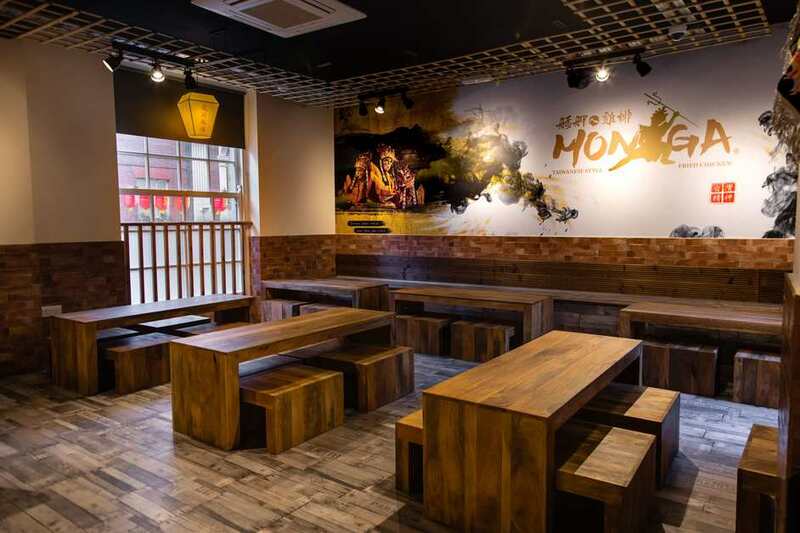 Taking its name from Taipei's oldest district, Wanhua, also known as Monga, the restaurant focuses on one of Taiwan's most renowned street snacks. Fresh chicken fillets are marinated with honey, dipped in batter instead of dry flour, and fried so that every bite from fried chicken is thick, juicy and tender at the same time. Inspired by East Asian culture and traditions, their logo features famous actor and celebrity, Nono, who created the brand alongside the declared 'King of Taiwanese Fried Chicken', Mingdao Liu. Designed by an in-house team from Taiwan, the 30 cover first floor dining room on Chinatown's Macclesfield Street is done up in gold, black and white and features a Taiwanese local opera mask of Guan Jiang Shou, a mythical figure alleged to be the guardian of the King of Inferno. Monga Fried Chicken gyms, sporting activities, health & beauty and fitness. The best pubs near London Monga Fried Chicken. Monga Fried Chicken clubs, bars, cabaret nights, casinos and interesting nightlife. Where to have your meeting, conference, exhibition, private dining or training course near Monga Fried Chicken. From cheap budget hotels to luxury 5 star suites see our special offers for Monga Fried Chicken hotels, including Radisson Blu Edwardian Hampshire Hotel from 89% off.